When exporting articles to PDF via the "Export to PDF" link shown to the right of content within InstantKB you may receive a message saying the PDF is corrupt. This can occur if the HTML that makes up your article is not well formed or valid XHTML. I'm afraid the PDF parser is quite strict and requires well formed XHTML to generate the PDF document from the article. We do attempt within the editor to ensure markup is valid XHTML as you add and edit content within InstantKB however if you paste from word or web pages for example you may run into problems. The PDF parser expects well formed XHTML transitional markup otherwise the PDF generated will be corrupt. In addition the Export to PDF feature within InstantKB cannot be applied when the article HTML contains <html>, <head>, <body> tags. This is a limitation of the ExportToPdf third party tool that InstantKB uses to export its content to PDF. Note that the content that you export from InstantKB should be a valid XHTML (it doesn't matter whether the XHTML standard is Strict or Transitional). To check your articles are valid XHTML when adding or editing articles within InstantKB click the "HTML" link in the button of the rick text editor. Select all of your article HTML and copy this into your computers clipboard. Paste the article HTML you copied into your computers clipboard into the textarea provided on the W3C validator page. Click the "Check" button. You should resolve any issues in your mark-up indicted as not well-formed by the W3C validator. To help with this problem we have a HTML validation tool built directly into the InstantKB editor. To enable the W3C validation tool within InstantKB please navigate to your InstantKB installation and open the RadControls/Editor/ToolsFileFull.xml. 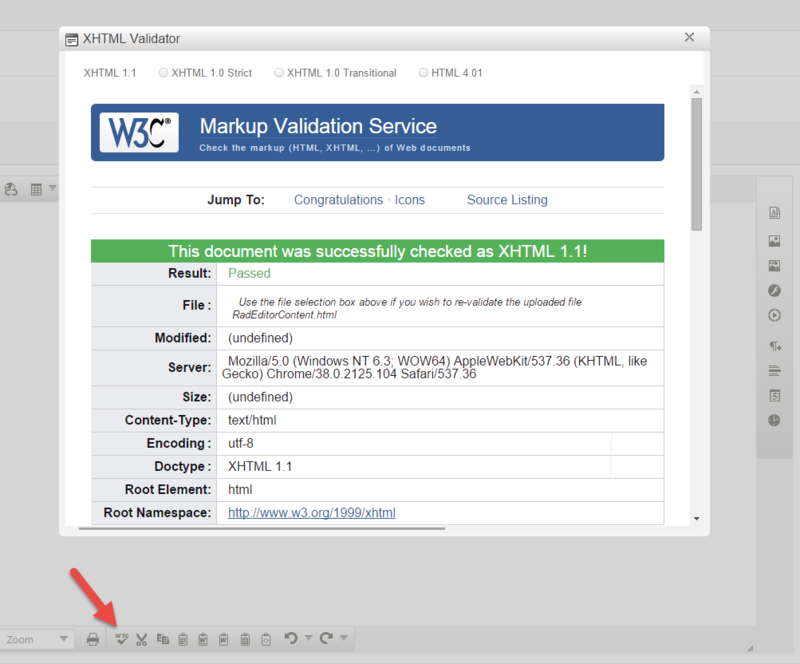 You can check the markup using the built-in W3C validator dialog or at https://validator.w3.org/check. We are working to make the PDF parser more flexible however this will take a little work. If you can't ensure your articles will be valid XHTML for now i would suggest disabling the Export to PDF option via the Member Permissions page within the Admin CP to avoid any further exceptions. We hope this suggestion helps you resolve the problem. If we can assist further of course please don't hesitate to contact us or open a support ticket. Article has been viewed 9K times.